Create bilingual or multilingual forms with help from Polylang. Polylang is a free WordPress translation plugin that many rave about. 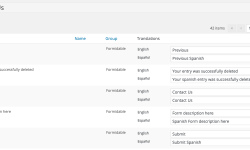 It's easy to use the same form in multiple languages, while keeping all your collected data in one place. Get started with Formidable Forms today! Please note: This add-on requires Polylang 1.9+ or higher.